Hematopoiesis is one of stem cell-sustained somatic organ systems in which billion of blood cells are being formed per day throughout lifetime of an individual. 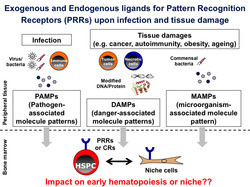 Blood homeostasis is maintained by very rare population of hematopoietc stem cells (HSCs) that slowly self-renew and multi-lineage differentiate into functionally mature blood cells via rapid dividing lineage intermediate progenitors. The special HSC identity is conserved in a specialized microenvironment in the bone marrow (BM), often referred to as "BM niche" that supply pivotal factors for HSC maintenance. While genetic engineering of animal models have allowed to uncover many vital factors that regulate self-renewal and differentiation of HSCs, little is known about the cellular and molecular components of the human BM niche. In this project, we take a developmental tissue engineering approach that allows to ex vivo generate a human cartilage template (ossicle) with human adult BM-derived mesenchymal stromal cells (MSCs), and to in vivo develop human bone organs, through endochondral ossification (Scotti, Piccinini, Takizawa, et. al., PNAS 2013). To study human BM niche homeostasis and pathology, we aim to generate the ossicles from normal and malignant human BM-MSCs, and dissect cellular and molecular BM niche components by reengineering the ossicles via genetic manipulation of MSCs. 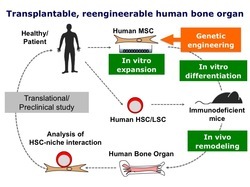 This transplantable, reengineerable human bone organ unit will serve a versatile platform not only to understand human BM niche homeostasis and disease, but also to preclinically test newly developed drugs or develop new therapy. Upon hematopoietic challenges such as infection, inflammation, short-lived immune effector cells are rapidly consumed at the site of hematopoietic demand, and need to be replenished by HSCs in bone marrow (BM) eventually. A fundamental question is how the hematopoietic demand is sensed and translated into enhanced hematopoiesis by distal BM resident HSC. In this project, we aim to tackle this question by using mouse models in which acute or chronic inflammation is induced upon bacterial infection or autoimmunity. For the infection model, we have recapitulated systemic infection by injecting lipopolysaccharide (LPS) that composes cell wall of gram negative bacteria and is recognized by a cognate immune senser, Toll-like receptor (TLR)-4. Preliminary results have demonstrated that systemic application of LPS directly activates TLR4 in HSCs and decreased their competitive fitness through increased division and DNA damage responses. 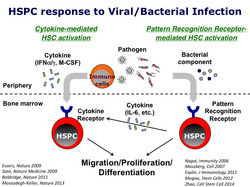 These findings indicate pathogen recognition receptor-mediated demand-sensing mechanism in HSC, and propose possibility of how chronic inflammation increases risk for development of malignant HSC disorders as observed in the population-based studies and animal models. We have extended these findings to study how HSC function is affected by other inflammatory conditions, and have also been interested in testing the impact of chronic inflammation on leukemogenesis by using different leukemic mouse models. Ageing of hemato-lymphoid system is characterized by thymic involution, expansion of memory B and T cell pool, narrowed spectrum of acquired immune receptors, favored myelopoiesis at the expense of lymphopoiesis, clonal hematopoiesis, all of which together lead to increased susceptibility to infection, and increased risk of myeloid blood cancer. 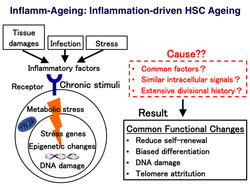 Some of these ageing phenotypes are attributed from functional changes of HSCs, including decreased self-renewal, myeloid biased lineage output, and accumulation of genetic ablations. Here we set out to ask the question how relatively intrinsic and extrinsic changes affect HSC functionality during ageing, with main focus on HSC divisional behavior, as it has been suggested that there is a correlation between stem cell division and risk of cancer.